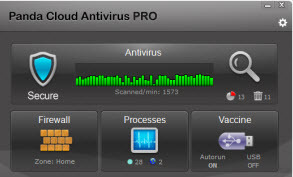 Panda Cloud Antivirus 2.0 is now available for download.It is available in free and Pro version. New behavioral analysis engine in the free edition. Process monitor allows seeing Internet connections on a per process basis. Improved performance and 50% faster scans. New advanced configuration options such as asking for confirmation before neutralizing. Ability to manage different licenses. Community-based firewall (pro edition only).